The Safety and Pro-Safety rulers are combination ruler and straight edge. The curved aluminum guard prevents you form accidentally cutting your fingers. Ideal for sign making and large format digital printing. It is 2.6" wide with a 2" grip and your hand fits inside the curved finger guard. 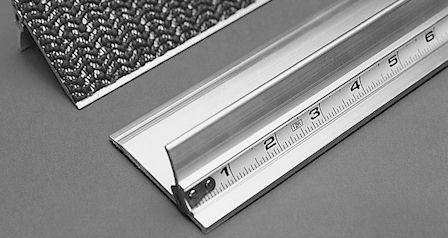 The Safety Ruler has a solid aluminum alloy body with an extra thick cutting face, a built-in handle for easy pick-up, and increments in inches (16ths). The Pro-Safety Ruler features a hardened stainless steel cutting face for durability and a non-slip backing for stability. These squares are used where accurate right angles are essential and for checking external and internal 90° angles. The beam is riveted to the fully ground and polished steel blade. There is a groove on the inside corner of the beam for clearance of dirt or burrs. This package consists of four different French curves made of heavy weight clear plastic with all edges perfectly smooth. Each curve is individually wrapped in polyethylene and the set is packaged in a vinyl envelope.